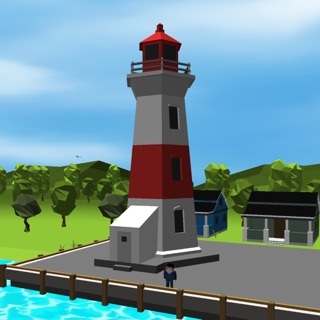 The best tycoon game available on iOS is here. Have you ever thought you could tap your way to becoming a billionaire? Don’t be idle, setting up a business has never been that easy. See what it would be like to sleep on piles of money. 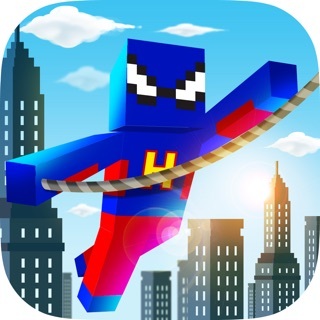 – Build your own empire tap, it won’t take more than a few taps of your finger! 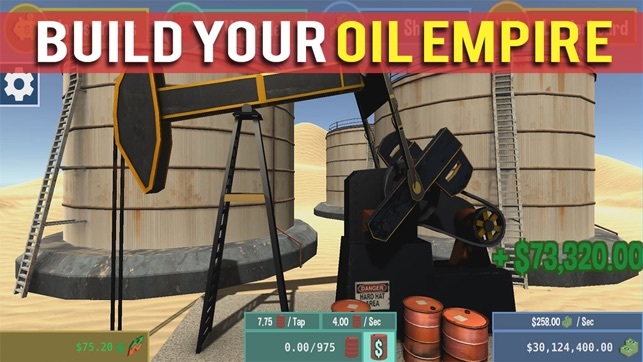 Download Big Oil now to live the capitalist dream. 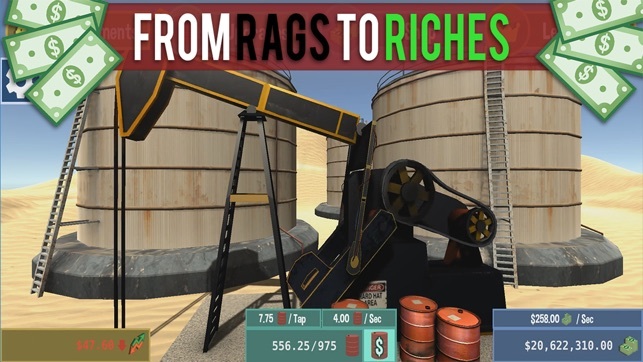 With Big Oil, you’re always just a tap or two away from becoming a billionaire! This electrifying combination of clicker and tycoon won’t let you put down your phone. Always wanted to take advantage of the capitalist system? Now you can see if the lifestyle of a billionaire is what you really wish for. Tap your way towards accruing a chunk of change that will make your friends beg for a just a fraction. All it takes is to download Big Oil! 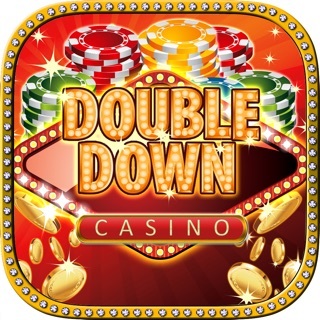 With its modern, multifaceted approach to fun, the game will make you into much more than just an idle clicker. Every tap has a deep meaning as it is quickly converted into hard currency; and that currency, into numerous assets. 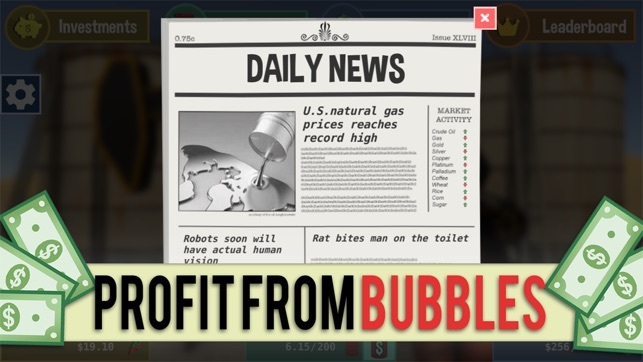 Create your own empire tap and learn how to play the capitalist system! It’s not difficult to become a billionaire when every tap brings your business closer to fruition. 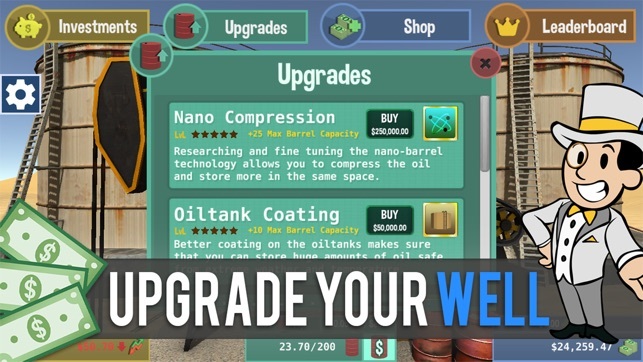 Download Big Oil and see how you can become a king of the oil industry by little more than clicking & planning! All you need to do is take out your phone, play Big Oil and… Suddenly, you’re in charge of your very own business; you’re a true capitalist. Sounds exciting? Get clicking now to get your business off the ground. It can soon grow into a remarkable empire, just don’t be idle! 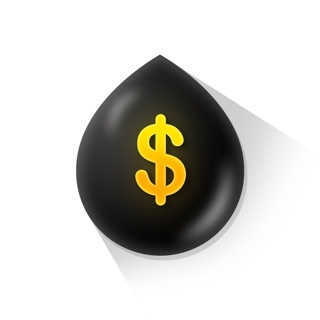 Big Oil will let you see how you would fare as the owner of a financial empire tap. Get into the fun-tactic frenzy of unceasing clicking and use your money wisely to let your empire grow. 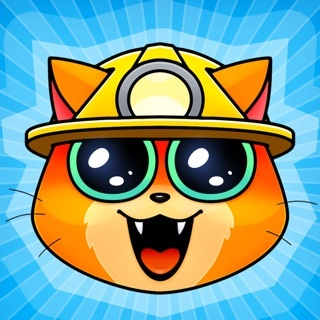 Download the game now! •	You get to experience the life of a billionaire! •	See what it’s like to own a business and grow it into an empire tap! 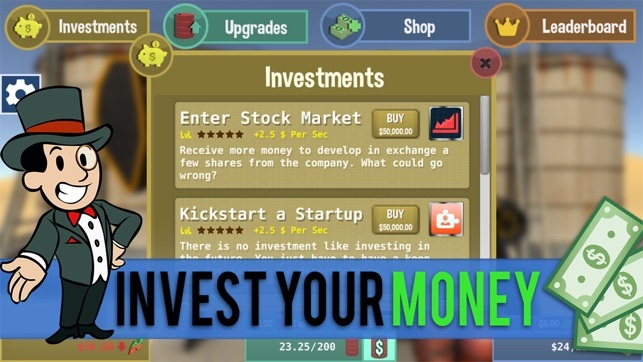 Download the game now and prove you’re worthy of your very own financial empire! The game was going good for a few minutes, then asked to be rated. Thankfully I waited until the ads started popping up and BOY did they! Literally 4 ads within 30 seconds before ASKING for you to pay for the ad removal to which I said no, basically saying, yeah, we’ll just keep throwing out ads at you if you wont pay. Noooooope. Thats a bad way to go about it. Not sure what makes this game 4 star.